VOTE NOW FOR TEAM UPTMORE! 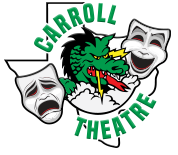 Teams receive “votes” through monetary donations to Carroll Theatre. You may vote online (by making an online credit card donation) and/or at the live event on February 7 (by making cash donations). All votes (donations) are tallied at the event, and the winner is the team that raised the greatest amount of money! Are you ready to help your favorite team take home the Mirror Ball trophy? Vote now by making a donation using the form here! We use the Remind tool to communicate important announcements and updates! To join our lists (we have several for students & parents! ), please contact our Booster President for the appropriate text codes. Students will get codes in class. If you’re NOT on our Remind lists, you’re missing out! We have sent out the tentative rehearsal calendar for all shows, so please contact us & sign up!